Introduce lighter tones to her special occasion edit with our baby blue ruffle skater dress. Exclusively yours, this polished piece is the perfect choice to greet all her favourite occasions with the utmost elegance. 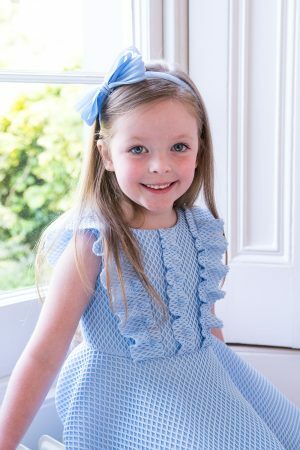 Specifically designed for parties, wedding ceremonies and Sunday Best, this charming fit and flare gown offers a bespoke look your little one is sure to adore for spring. 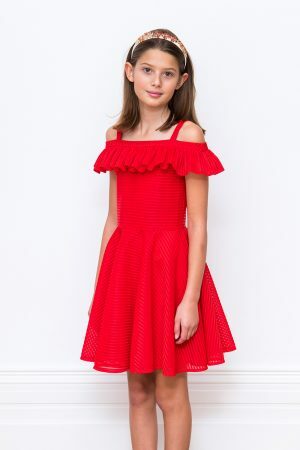 Available in a modern skater silhouette with diamond mesh fabric throughout, this simple style offers luxe textures to ensure your girl feels fabulous at every upmarket event. 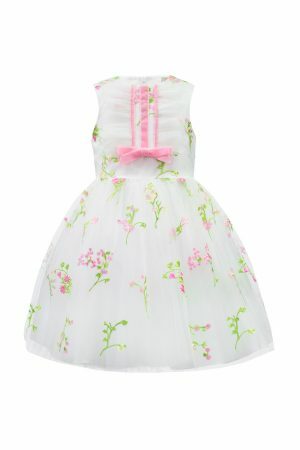 Soft bodice ruffles also lend a touch of artisan detailing ready for your princess to step out in style. Concealed zip to fasten. Introduce lighter tones to her special occasion edit with our baby blue ruffle skater dress. Exclusively yours, this polished piece is the perfect choice to greet all her favourite occasions with the utmost elegance. 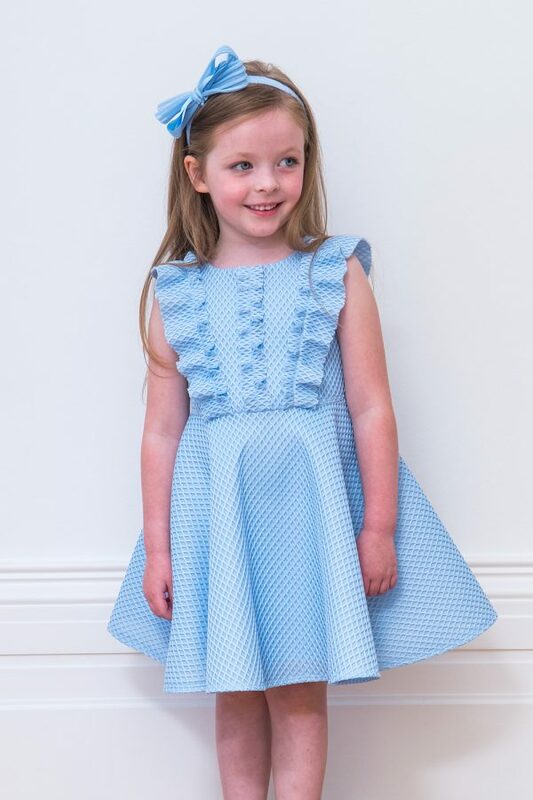 Specifically designed for parties, wedding ceremonies and Sunday Best, this charming fit and flare gown offers a bespoke look your little one is sure to adore for spring. 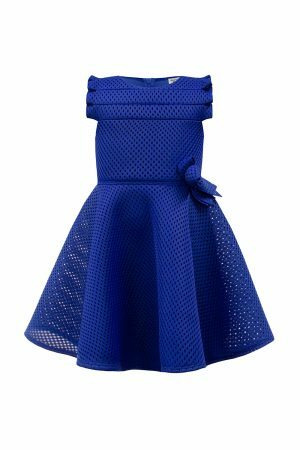 Available in a modern skater silhouette with diamond mesh fabric throughout, this simple style offers luxe textures to ensure your girl feels fabulous at every upmarket event. Soft bodice ruffles also lend a touch of artisan detailing ready for your princess to step out in style. Concealed zip to fasten. Embrace colourful blooms with our pink floral bardot birthday dress. 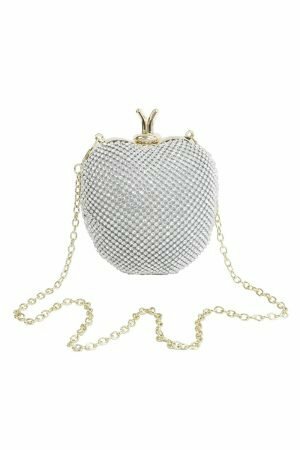 Yours to cherish, this fashion-forward style is sure to capture your girl’s elegance in a heartbeat. Available in a pink satin fabric with contrasting accents throughout, note how the floral motif lends instant couture appeal. 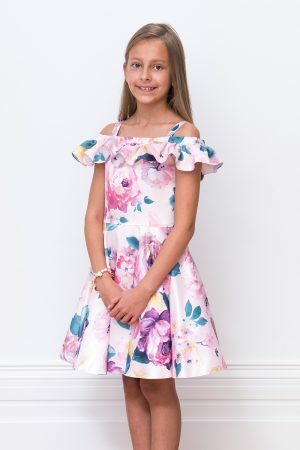 Perfect for birthday parties, prom dates and family celebrations, our fit and flare gown offers an off-the-shoulder Bardot style with elasticated shoulder straps for an on-trend yet comfortable appeal your girl will adore. This luxury birthday dress also includes a statement ruffle designed to frame the shoulders and complement your sweetheart’s finished ensemble. Concealed zip to fasten.